The decline was probably due to the use of a vaccine against Streptococcal pneumoniae, the chief cause of ear infections in the 1980s. The findings aren't all good news, though. Doctors see many ear infections now that are due to different organisms than during the 1980s, and some of these bacteria are resistant to amoxicillin, the drug usually used to treat ear infections. The extensive study found that the risk factors for ear infections did not change significantly from the 1980s to 2016. Day care attendance and family history of ear infections are still the major risk factors for determining a child's chance of having ear infections. Researchers from Rochester General Hospital Research Institute in Rochester, NY conducted the study. Their findings were published August 7 in the online version of the September edition of Pediatrics. It can be hard to tell if an infant has an ear infection, but the guidelines from American Association of Pediatrics suggest crying that might signal pain — as opposed to cries relieved by feeding, a diaper change, or a nap — and tugging at the ear are good signs. The guidelines recommend diagnosing acute otitis media (the medical term for an ear infection) in children who have moderate to severe bulging of the tympanic membrane (ear drum). Even though the number of doctor visits for ear infections dropped from 950 per 1000 children in 1995–1996 to 634 per 1000 children in 2005–2006, over eight million children under the age of five had ear infections in 2009. In 2000, a vaccine against pneumococcus (PCV7) was introduced to protect young children and older people against invasive pneumococcal disease. Pneumococcal disease can infect the brain, spinal cord, and bloodstream, while pneumococcal pneumonia infects the lungs. In 2010, a new, more effective version of the vaccine (PCV13) was released, protecting against six more strains. In the US, infants get the vaccination as part of checkups at two, four, and six months of age, with a booster given at 12 to 15 months. 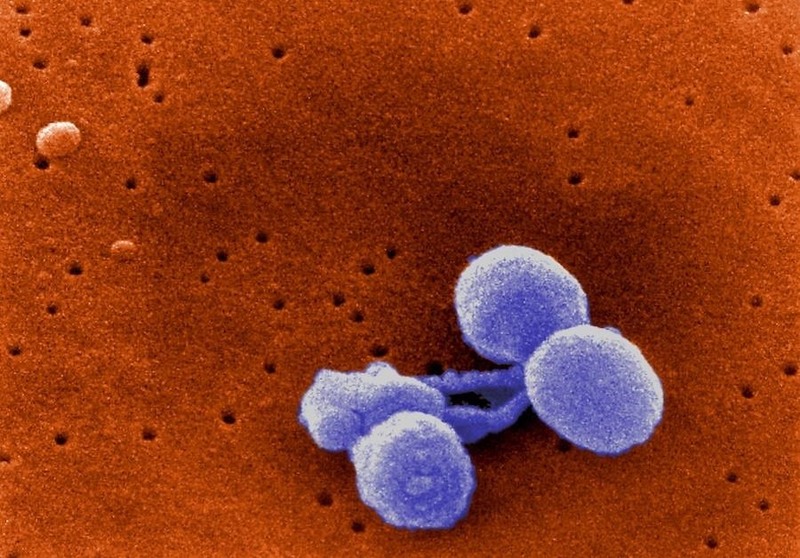 The pneumococcal bacteria, Streptococcus pneumoniae is traditionally thought to cause most ear infections. With the advent of the pneumococcal vaccine, researcher Ravinder Kaur, of Rochester General Hospital Research Institute, and her colleagues decided to study how the vaccine has changed the rates of infection, bacterial causes, and other factors that might influence risk for the infections. The investigators recruited 615 six-month old children into their study. They evaluated them at regular intervals until they were three years old, during the period from June 2006 to June 2016. Children enrolled in the study between 2001 and 2010 received the Pneumococcal vaccine PCV7, and children from 2010 to 2016 got the PCV 13 version. 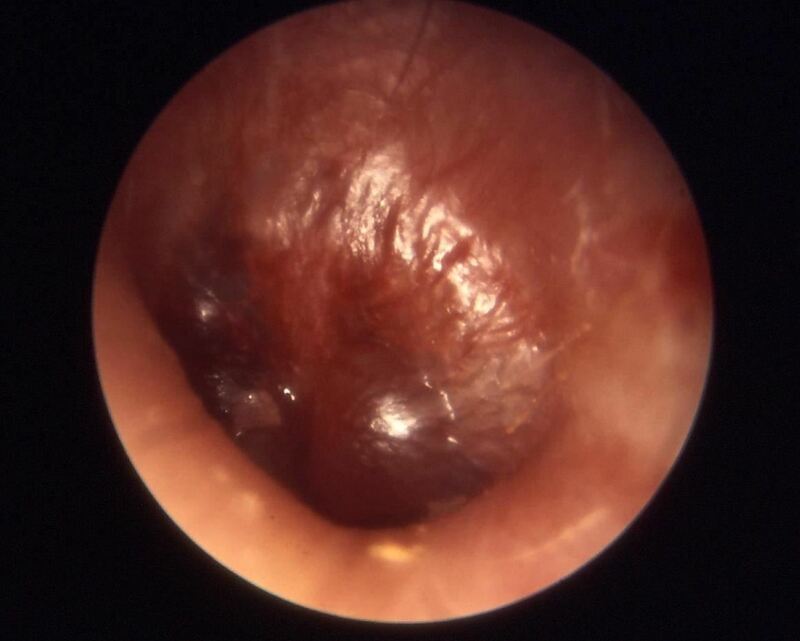 When symptoms were present, children in the study were checked to see if they had acute otitis media using the American Academy of Pediatrics criteria for diagnosis that involve the degree of bulging of the eardrum and a pain evaluation. All infections were confirmed by withdrawing fluid from the child's middle ear and culturing the fluid in the lab to confirm the presence and type of bacteria. The researchers also collected information on daycare attendance, exposure to secondhand smoke, breastfeeding, allergies, which pneumococcal vaccine was received, as well as whether others in the infant's family had recurrent ear infections. Most ear infections occurred between the ages of six and 12 months. By the time the children in the study were one year old, 23% had had one case of acute otitis media. By three years old, 60% had experienced one episode, and 24% had had three ear infections. These rates represented a significant decrease from those found in a 1989 report from a study done in Boston. In that study, 80% of the children had one ear infection by age three, and more than 40% of those kids had more than three. In children who had one or more infections in the first year of life, the new study found an increased risk in males, non-Hispanic whites, those with a family history of recurrent ear infections, or who attended day care. Children who had at least three episodes of acute otitis media in a six-month period or at least four within a year, were more likely to be males, attend daycare, and have a family history of the infections. Breastfeeding decreased overall risk of ear infections — children breastfeed at least 50% of the time in the first six months of life were significantly less likely to have at least one case of acute otitis media. Just like the 1980s, day care attendance and family history are still the main risks for development of ear infections. However, the researchers saw a shift in the type of bacteria causing the infections. Before routine vaccination of children with pneumococcal vaccines, Streptococcus pneumoniae was usually the leading bacterial cause of acute otitis media. The study by Kaur and colleagues found a significant decrease in the presence of that bacteria in middle ear fluid from infections that occurred in the period after PCV13 came into use and an increase in infections caused by Moraxella catarrhalis during that time. Hemophilus influenza is still commonly causing ear infections, and its prevalence hasn't greatly changed since the use of pneumococcal vaccines. 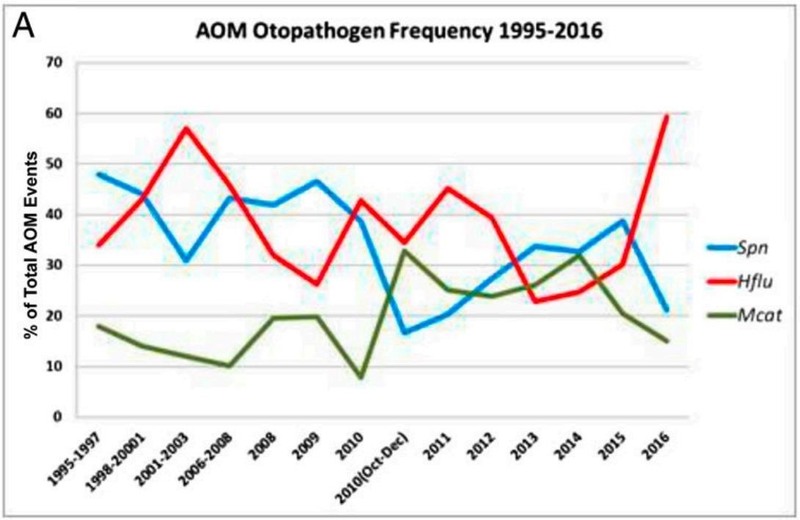 The frequency of pathogens isolated from ear infections studied in the paper, from 1995 to 2016, as a percent of total ear infections. Spn is S pneumonia; Hflu is H influenzae; and Mcat is M catarrhalis. Image via Kaur, et al., Pediatrics, 2017. One of the big problems with these changes is that none of the Moraxella catarrhalis and only 50% of the Hemophilus influenza infections were sensitive to amoxicillin, the antibiotic commonly used to treat ear infections. Although risk factors have not changed, the finding of significant antibiotic resistance is troubling. In routine pediatric care, doctor's don't usually test middle ear fluid for the types of bacteria present to determine the best antibiotic for treatment. Current American Association of Pediatrics guidelines state that amoxicillin should be prescribed if antibiotic treatment is indicated (it isn't usually) for an ear infection, but the drug will no longer cure many ear infections, adding to the resistance problem. More studies need to be done to determine the best way to treat acute otitis media in young children. Most ear infections don't require antibiotics, but if your doctor prescribes them, ask him or her what to do if your child doesn't improve when taking the medication. They may have an infection with an organism resistant to the antibiotic prescribed.